I did this painting when I was 28 years old. I drove my dad to the hospital not far from the 210 freeway. 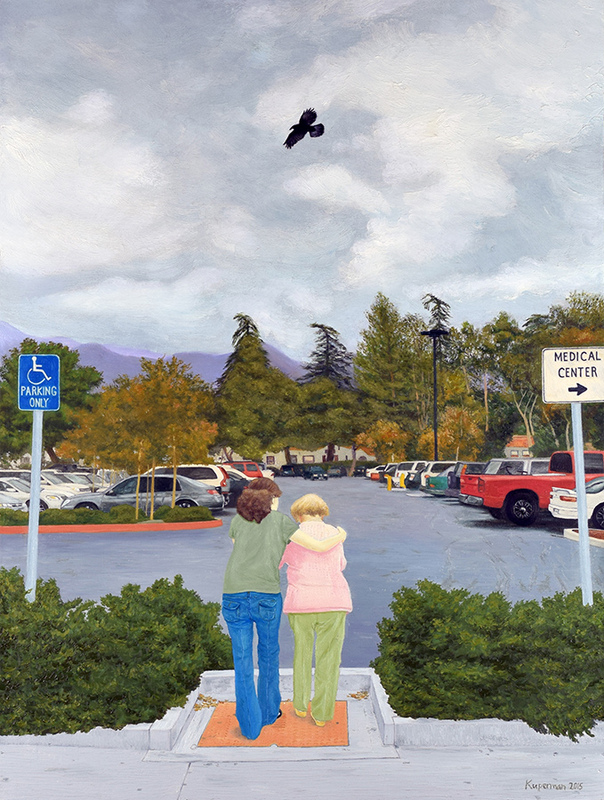 As I was waiting in the parking lot, I saw a young woman helping an elderly woman walk and above them was a black bird, possibly a raven over stormy gloomy clouds. I went outside and took a photo of the parking lot a few minutes afterwards. I then recreated the composition with the people and the bird. Now years later I decided to paint it and here it is. This painting shows the young helping the elderly. Although there is an impending death for the elderly lady suggested by the bird and the heavy stormy clouds, the young woman helping her is giving her comfort on wherever they are heading to from or to the hospital. The young lady still has her life ahead of her while the elderly is about to meet her end soon. I created heavy rough textured clouds to suggest that a storm is coming soon along with the bird suggesting death. 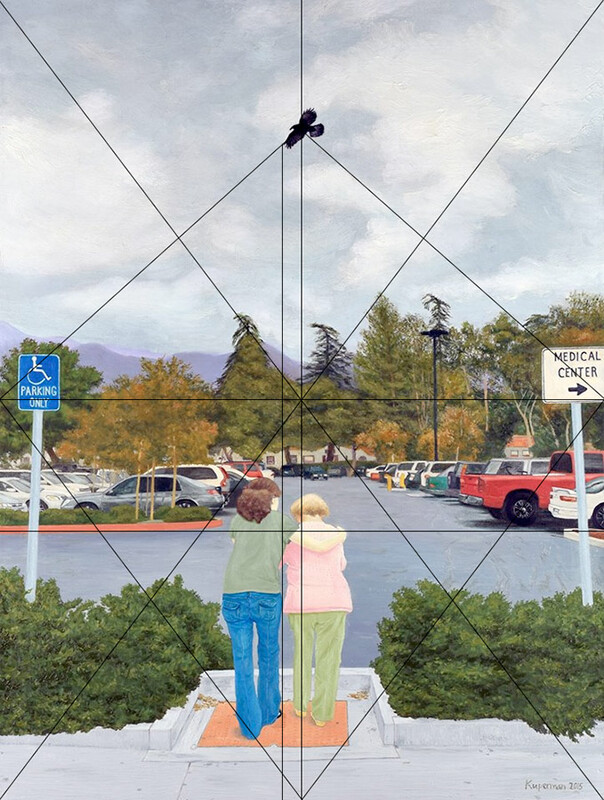 The shirt of the young lady and the old lady’s pants are both different shades of green suggesting that they are related as in that is possibly her grand daughter that is helping her on the way. This is something we all deal with in our lives. As the younger generations grow up the older generations pass away. I hope you enjoyed this painting and the description. I decided to break down one of my paintings. I have thought about the composition elements before starting it, and fine tuned some main things which you see. In this breakdown I will analyze the diagonal lines. First thing is that the crow is in the upper middle, and also right above the elderly lady’s head. With this notion it symbolizes impending death. the left end of the crow’s wing when a line is drawn straight down, separates the two figures. The two figures are also in the lower diamond center of this composition and their two heads are in the upper triangle part of the diamond. The elderly lady is away from the vehicles on the right hand side which symbolizes that she won’t continue to go on, in which the analogy of the vehicle and life as to drive. The younger lady on the left touches the vehicles which symbolizes that she has still a long way to go. The vehicle leaving over the elderly lady’s head, is also a symbol that it is just about her time to leave this world behind. I hope you enjoyed this break down. Thank you for reading and viewing.